The bond angles in aziridine are approximately 60°, considerably less than the normal hydrocarbon bond angle of 109.5°, which results in angle strain as in the comparable cyclopropane and ethylene oxide molecules. A banana bond model explains bonding in such compounds. Aziridine is less basic than acyclic aliphatic amines, with a pKa of 7.9 for the conjugate acid, due to increased s character of the nitrogen free electron pair. Angle strain in aziridine also increases the barrier to nitrogen inversion. This barrier height permits the isolation of separate invertomers, for example the cis and trans invertomers of N-chloro-2-methylaziridine. There are several syntheses of aziridines (aziridination). An amine functional group displaces the adjacent halide in an intramolecular nucleophilic substitution reaction to generate an aziridine. Amino alcohols have the same reactivity, but the hydroxy group must first be converted into a good leaving group. The cyclization of an amino alcohol is called a Wenker synthesis (1935), and that of a haloamine the Gabriel ethylenimine method (1888). Nitrene addition to alkenes is a well-established method for the synthesis of aziridines. Photolysis or thermolysis of azides are good ways to generate nitrenes. Nitrenes can also be prepared in situ from iodosobenzene diacetate and sulfonamides, or the ethoxycarbonylnitrene from the N-sulfonyloxy precursor. 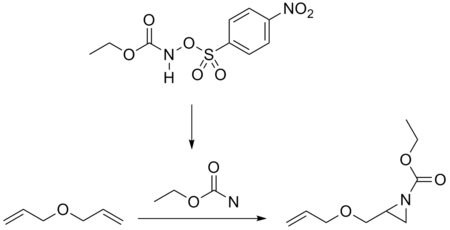 Thermal treatment or photolysis of triazolines expels nitrogen, producing an aziridine. Triazolines can be generated by cycloaddition of alkenes with an azide. The other method involves the ring-opening reaction of an epoxide with amines, followed by ring closing with the Mitsunobu reaction. In 2014, a new method was described to produce Aziridines By reacting an Alkene (olefin) with O-(2,4-dinitrophenyl)hydroxylamine (DPH) via homogeneous rhodium catalysis, alone. This method is operationally simple (i.e., one-pot) with excellent yield. Alkene + DPH (in presence of Rhodium catylist) -> Aziridine. Phe-Aziridine-Me can then undergo a simple ring opening reaction to form dextroamphetamine and levoamphetamine (the two active ingredients in Adderall). Aziridines are reactive substrates in ring-opening reactions with many nucleophiles due to their ring strain. Alcoholysis and aminolysis are basically the reverse reactions of the cyclizations. Carbon nucleophiles such as organolithium reagents and organocuprates are also effective. Certain N-substituted azirines with electron withdrawing groups on both carbons form azomethine ylides in an electrocyclic thermal or photochemical ring-opening reaction. These ylides can be trapped with a suitable dipolarophile in a 1,3-dipolar cycloaddition. This reaction type requires a Lewis acid catalyst such as boron trifluoride. In this way 2-phenyl-N-tosylaziridine reacts with alkynes, nitriles, ketones and alkenes. Certain 1,4-dipoles form from azetidines. The toxicology of a particular aziridine compound depends on its structure and activity, although sharing the general characteristics of aziridines. As electrophiles, aziridines are subject to attack and ring-opening by endogenous nucleophiles such as nitrogenous bases in DNA base pairs, resulting in potential mutagenicity. Inhalation and direct contact. Some reports note that the use of gloves has not prevented permeation of aziridine. It is therefore important that users check the breakthrough permeation times for gloves, and pay scrupulous attention to avoiding contamination when degloving. Workers handling azidrine are expected to be provided with, and required to wear and use, a half-mask filter-type respirator for dusts, mists and fumes. There is relatively little human exposure data on aziridine. This is because it is considered extremely dangerous. In industrial settings, class A pressure suits are preferred when exposure is possible. The International Agency for Research on Cancer (IARC) has reviewed aziridine compounds and classified them as possibly carcinogenic to humans (IARC Group 2B). In making the overall evaluation, the IARC Working Group took into consideration that aziridine is a direct-acting alkylating agent which is mutagenic in a wide range of test systems and forms DNA adducts that are promutagenic. Aziridines are irritants of mucosal surfaces including eyes, nose, respiratory tract and skin. Aziridine rapidly penetrates skin on contact. Skin sensitizer — causing allergic contact dermatitis and urticaria. ↑ "Aziridine" (PDF). Re-evaluation of Some Organic Chemicals, Hydrazine and Hydrogen Peroxide. IARC Monographs on the Evaluation of Carcinogenic Risks to Humans. 71. 1999. 1 2 3 4 5 "NIOSH Pocket Guide to Chemical Hazards #0274". National Institute for Occupational Safety and Health (NIOSH). ↑ Weast, Robert C.; et al. (1978). CRC Handbook of Chemistry and Physics (59th ed.). West Palm Beach, FL: CRC Press. ISBN 0-8493-0549-8. 1 2 "Ethyleneimine". Immediately Dangerous to Life and Health. National Institute for Occupational Safety and Health (NIOSH). ↑ Gilchrist, T.L. Heterocyclic chemistry. ISBN 0-582-01421-2. ↑ M. Antonietta Loreto; Lucio Pellacani; Paolo A. Tardella; Elena Toniato (1984). "Addition reactions of ethoxycarbonylnitrene and ethoxycarbonylnitrenium ion to allylic ethers". Tetrahedron Letters. 25 (38): 4271–4. doi:10.1016/S0040-4039(01)81414-3. ↑ Ryan Hili; Andrei K. Yudin (2006). "Readily Available Unprotected Amino Aldehydes". J. Am. Chem. Soc. 128 (46): 14772–3. doi:10.1021/ja065898s. ↑ B. Pulipaka; Stephen C. Bergmeier (2008). "Synthesis of Hexahydro-1 H -benzo[ c ]chromen-1-amines via the Intramolecular Ring-Opening Reof Aziridines by π-Nucleophiles". Synthesis (9): 1420–30. doi:10.1055/s-2008-1072561. ↑ Hoch, Compt. rend., 196, 1865 (1934); (a), ibid., aOS, 799 (1936); (e), ibid., 204, 358 (1937). ↑ Kenneth N. Campbell; James F. Mckenna (1939). "The action of Grignard reagents on oximes. i. The action of phenylmagnesium bromide on mixed ketoximes". J. Org. Chem. 4 (2): 198–205. doi:10.1021/jo01214a012. ↑ Kenneth N. Campbell; Barbara Knapp Campbell; Elmer Paul Chaput (1943). "The reaction of Grignard reagents with oximes. ii. The action of aryl grignard reagents with mixed ketoximes". J. Org. Chem. 8 (1): 99–102. doi:10.1021/jo01189a015. ↑ Kenneth N. Campbell; Barbara K. Campbell; James F. Mckenna; Elmer Paul Chaput (1943). "The action of Grignard reagents on oximes. iii. The mechanism of the action of arylmagnesium halides on mixed ketoximes. A new synthesis of ethyleneimines". J. Org. Chem. 8: 103–9. doi:10.1021/jo01189a016. ↑ Jat, Jawahar L.; Paudyal, Mahesh P.; Gao, Hongyin; Xu, Qing-Long; Yousufuddin, Muhammed; Devarajan, Deepa; Ess, Daniel H.; Kürti, László; Falck, John R. (2014-01-03). "Direct Stereospecific Synthesis of Unprotected N-H and N-Me Aziridines from Olefins". Science. 343 (6166): 61–65. doi:10.1126/science.1245727. ISSN 0036-8075. PMC 4175444 . PMID 24385626. ↑ Yuhei Fukuta; Tsuyoshi Mita; Nobuhisa Fukuda; Motomu Kanai; Masakatsu Shibasaki (2006). "De Novo Synthesis of Tamiflu via a Catalytic Asymmetric Ring-Opening of meso-Aziridines with TMSN3". J. Am. Chem. Soc. 128 (19): 6312–3. doi:10.1021/ja061696k. ↑ Harold W. Heine; Richard Peavy (1965). "Aziridines XI. Reaction of 1,2,3-triphenylaziridine with diethylacetylene dicarboxylate and maleic anhydride". Tetrahedron Letters. 6 (35): 3123–6. doi:10.1016/S0040-4039(01)89232-7. ↑ Albert Padwa; Lewis Hamilton (1965). "Reactions of aziridines with dimethylacetylene dicarboxylate". Tetrahedron Letters. 6 (48): 4363–7. doi:10.1016/S0040-4039(00)71101-4. ↑ Philippe Dauban; Guillaume Malik (2009). "A Masked 1,3-Dipole Revealed from Aziridines". Angew. Chem. Int. Ed. 48 (48): 9026–9. doi:10.1002/anie.200904941. ↑ Ioana Ungureanua; Cristian Bologab; Saïd Chayera; André Mann (16 July 1999). "Phenylaziridine as a 1,3-dipole. Application to the synthesis of functionalized pyrrolidines". Tetrahedron Letters. 40 (29): 5315–8. doi:10.1016/S0040-4039(99)01002-3. ↑ Aravinda B. Pulipaka; Stephen C. Bergmeier (2008). "A Synthesis of 6-Azabicyclo[3.2.1]octanes. The Role of N-Substitution". J. Org. Chem. 73 (4): 1462–7. doi:10.1021/jo702444c. ↑ Kanerva L, Keskinen H, Autio P, Estlander T, Tuppurainen M, Jolanki R (May 1995). "Occupational respiratory and skin sensitization caused by polyfunctional aziridine hardener". Clin Exp Allergy. 25 (5): 432–9. doi:10.1111/j.1365-2222.1995.tb01074.x. PMID 7553246. ↑ Sartorelli P, Pistolesi P, Cioni F, Napoli R, Sisinni AG, Bellussi L, Passali GC, Cherubini Di Simplicio E, Flori L (2003). "Skin and respiratory allergic disease caused by polyfunctional aziridine". Med Lav. 94 (3): 285–95. PMID 12918320. ↑ Mapp CE (2001). "Agents, old and new, causing occupational asthma". Occup. Environ. Med. 58 (5): 354–60. doi:10.1136/oem.58.5.354. PMC 1740131 . PMID 11303086. ↑ Some Aziridines, N-, S- and O-Mustards and Selenium (PDF). IARC Monographs on the Evaluation of Carcinogenic Risks to Humans. 9. 1975. ISBN 92-832-1209-6.